By now, you may have heard, that my Crock Pot is my best friend. 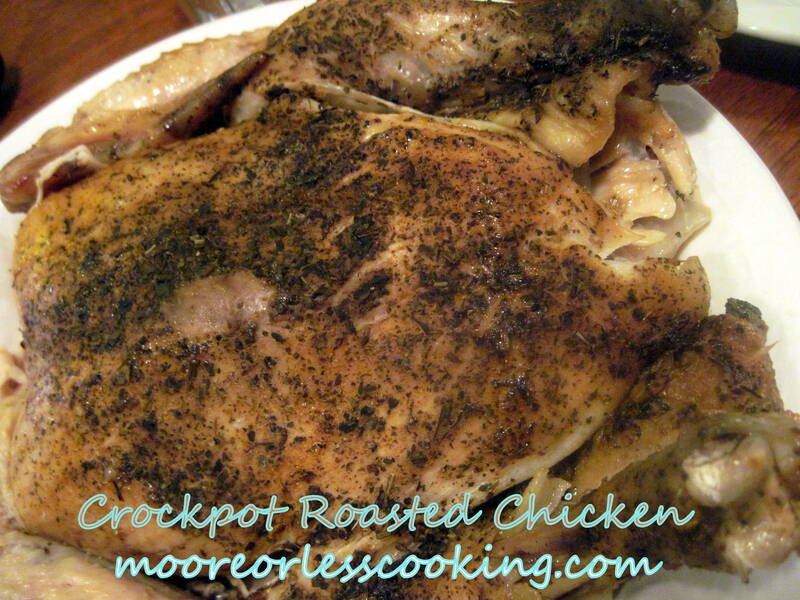 Yes, it hasn’t let me down, so I had to try this Whole Chicken recipe for the crock pot. It is a “roasted” chicken, roasted with quotes, because it is tender and moist, just like a roasted chicken would be in quotes, but not crispy skin, like a “roasted” chicken would be in quotes! I couldn’t believe how easy this recipe is, with fantastic results! I didn’t add and butter or oil because the chicken creates such delicious juices, you won’t miss it. Just set your crock pot timer and let your chicken turn into the moistest, juiciest chicken you have ever sunken your teeth into. If you really want crispy chicken skin, just place your chicken under the broiler for a couple minutes, but believe me, I didn’t miss it. You can do so much with the roasted chicken, you can make chicken salad, chicken soup, the recipes are endless, or just eat it as is! Place foil balls in bottom of crock pot. Pat chicken dry and remove skin if desired to to lower fat content (chicken may be just slightly less juicy.) Sprinkle seasonings all over chicken, then place chicken breast-side up in crock pot. Cook on high for 3-4 hours, or low for 6-7, or until meat is tender, and thigh can be easily removed. I do not add butter or oil, when the chicken bakes, it makes it’s own juice.